Ryan Gosling Will Step Behind the Camera To Direct ‘How To Catch A Monster’!!! Ryan Gosling is finally taking that step behind the camera with his first film he will be directing. That film will be called ‘How To Catch a Monster’, which will be shopped around at the Toronto Film Festival. Christina Hendricks is attached to star in the film. Not only will Gosling direct, but he also wrote the script. 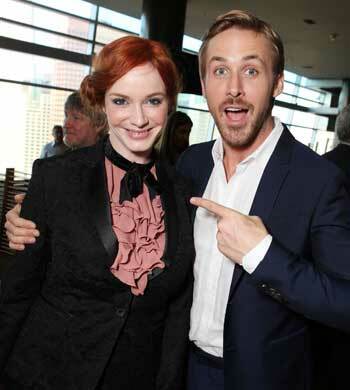 Hendricks and Gosling starred together in ‘Drive’. I guess they got along very well. Who wouldn’t though? I hear it is going to be a fantasy noir film. Shooting will being sometime in 2013. We hear this film weaves elements of fantasy noir, and suspense into a modern day fairytale. Set against the surreal dreamscape of a vanishing city, Billy, a single mother of two, is swept into a macabre and dark fantasy underworld while her teenage son discovers a secret road leading to an underwater town. Both Billy and Bones must dive deep into the mystery, if their family is to survive. Nicholas Hoult Front Runner For Part of J.R.R. Tolkien In Biopic!!! This entry was posted on Wednesday, August 29th, 2012 at 1:02 pm	and is filed under Film, News. You can follow any responses to this entry through the RSS 2.0 feed. You can skip to the end and leave a response. Pinging is currently not allowed. « The Film ‘Eden’ Get’s Distribution in the USA!! !